Widely used in medical environments, the Ultra 510 Pole Mount lets you easily adjust both monitor and keyboard to the most ergonomic and comfortable position for you. This mount rotates 360° at the pole and has two articulating arms that enable it to reach up to 40″ (102 cm) with monitor and keyboard. It’s a rigid, non-sagging arm with smooth articulation through its entire range of motion. The Ultra 510 Pole Mount can be used to mount a monitor, or a monitor and keyboard. It has an extensive number of combination choices, so you can configure it to precisely fit your requirements. It’s available in pole, wall, wall track, and desk mount options and can be configured with a laptop tray. 40″ (102 cm) with monitor and keyboard. Ultra 510 Pole Mount provides long reach and ultra compact stowage. Its stowed profile is 4.5″ (11.4 cm) with LCD only, and 9.75″ (24.8 cm) with LCD and keyboard. 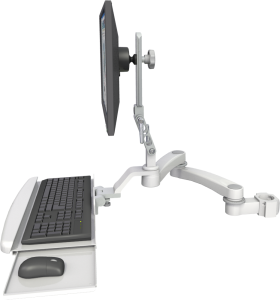 This arm provides smooth horizontal articulation, rotates 360° at the desk mount and swivels 360° at the extension arm joint. The monitor is supported by two articulating joints that provide 90° of tilt adjustment. The Ultra 510 Arm pivots for precise monitor and keyboard placement. ICW’s ball VESA adjustor enables the monitor to tilt, swivel and rotate to any desired viewing angle. The Ultra 510 Computer Mount is available in pole, desk, wall and wall track options. The Ultra 510 Pole Mount is a rigid, articulating arm that stows in a minimum amount of space. Built with high quality, durable internal and external parts, the Ultra 510 computer mounting arm is designed to provide years of dependable service. This arm moves easily through its range of motion and has adjustable rotation stops to protect the equipment and facility from damage. Internal cable management creates a neater appearance and protects wires. Machined from strong billet aluminum, the unit is powder coated for a durable, lasting finish. ICW computer mounts are designed, engineered, manufactured and hand-assembled with complete attention to detail. The Ultra 510 Pole Mount has long reach, stability, and smooth articulation. This arm can be configured with an LCD only, or an LCD and our standard keyboard tray. The arm mounts to a pole, wall, wall track or desk and can be configured with a laptop. With the Ultra 510 Pole Mount, your monitor and keyboard can be positioned exactly where needed, then stowed out of the way when not in use. The Ultra 510 Pole Mount supports up to 18 lbs (8.2 kg). Durable powder coated finish can be ordered in one of 5 color options. The Ultra 510 Pole Mount’s horizontal adjustment range is 23″ (58 cm) with LCD only, and 40″ (102 cm) with LCD and keyboard. The monitor moves 6″ (15.2 cm) vertically on sliding rails. The monitor is supported by two articulating joints that each provide 90° of tilt adjustment. ICW’s ball VESA monitor attachment enables 6 way tilt, swivel and rotate for fine-tuning monitor angle. The Ultra 510 Pole Mount extends horizontally, rotates 180° at the mount and swivels 360° at the arm joint for complete control of workstation position. The Ultra 510 Pole Mount is machined out of billet aluminum for strength and durability.